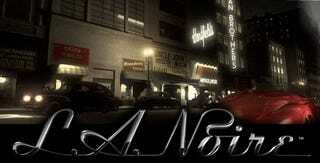 Remember L.A. Noire, the "interactive detective story" set in the late 1940s, set to be published by Rockstar Games? Apparently, so does the developer, Team Bondi, who are staffing up to maybe actually finish it. The Sydney, Australia area dev — headed by Brendan McNamara, former Director of Development for Sony’s Team Soho Studio which made The Getaway — has opened up the human resources floodgates, looking for animators, artists and programmers for L.A. Noire. The game was announced in late 2006 and was most recently pegged for a 2009 release. L.A. Noire does not, however, appear on parent company Take-Two Interactive's fiscal 2009 release list, which ends on October 31. Hey, it could still make the holidays! Team Bondi did a similar staff drive about this time last year, when it listed the game as planned for both the Xbox 360 and PlayStation 3 platforms. Remember, kids, this isn't the PlayStation exclusive franchise that Rockstar promised Sony. That's the next one. Anyway, if you're looking for a job where deadlines don't seem that critical poke around the open positions.